“Showboat”, an uneqivocal masterpiece, is the first great American musical play. Drawing on the tradition of European operetta, the Mississippi river showboats from which it gets its title, the minstrel show tradition and the Broadway stage, it lays the groundwork musically and thematically for the greatness that followed in its wake. It is also quintessentially American with its Jazz influenced score, its exploration of race relations, its celebration of showbiz and its symbolic use of the Mississippi river as a metaphor for the flow of life itself. This magnificent production is a magical time machine that delights in every detail. 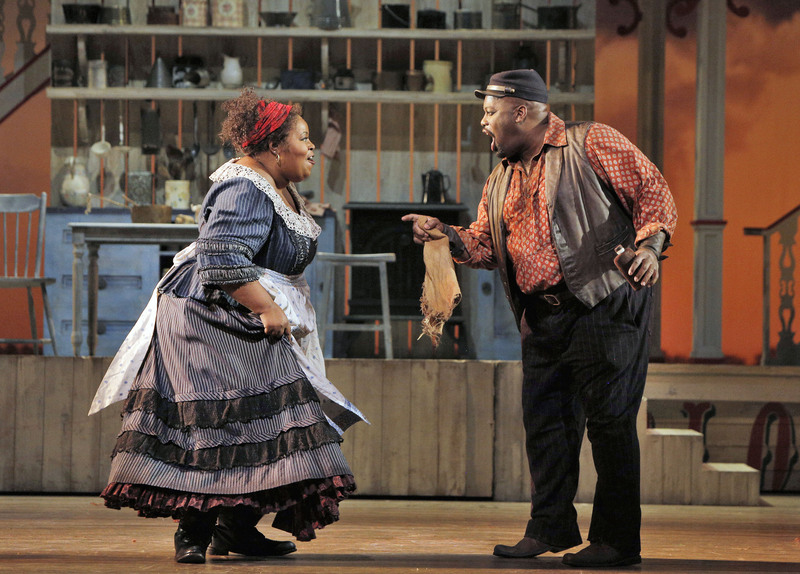 As Joe and Queenie, the leaders of the Black chorus and close friends of Showboat impressario Cap’n Andy, Morris Robinson and Angela Renee Simpson are extraordinary both as singers and actors. They are both accomplished opera performers in the classical repertoire, but here they seamlessly incorporate jazz and blues styles with no compromise in vocal excellence. They both make the spine tingle. The roles of Joe and Queenie also call for several spoken scenes and Robinson and Simpson shine here as well, with a purely natural acting style that fully discloses their sympathetic characters and the rich history of their long marriage. They handle the famous arias, “Ol’ Man River” and “Can’t Help Lovin’ Dat Man” with persuasive ease. Audiences will be surprised by the less well-known aria “Mis’ry’s Comin Aroun'” which is a marvelous singing and acting showcase for Ms. Simpson. The romantic leads of Cap’n Andy’s daughter Magnolia Hawks and river boat gambler turned actor Gaylord Ravenal are played respectively by Heidi Stober and Michael Todd Simpson (making his San Francisco Opera debut). Both are accomplished classical singers with impressive resumes. They handle Kern’s score with a pleasingly light touch and easily make us believe in their love affair. As Cap’n Andy Hawks, Broadway star and Tony Award winner Bill Irwin is at the top of his form. A master physical comedian, his every gesture provokes laughs. Harriet Harris (also a Tony Award winner) matches him hilariously as the overwhelmingly bossy Parthy Ann Hawks. In the small but pivotal role of Julia, Patricia Racette brings great cabaret-style chops to a memorable rendition of “Bill”. This “Showboat” is an astonishingly seamless blend of high and low art, melding grand opera voices with blues and cabaret. Most impressively, the acting is top notch throughout, and even with two Tony Award winning actors onstage, there is not a single moment in which the performances are out of balance. Before ending this rather lengthy review, I feel I should directly address the “elephant in the living room”: Is “Show Boat” offensively racist? My short answer is, “I don’t think so.” Certainly, any musical play from an era so close to that of the minstrel show, and, in particular, one that deals directly with questions of race relations, is going to be disturbing to today’s appropriately sensitized audiences. Yet, I do think that the good will evident in the lyrics and the telling of the story, the respectfully written and well-realized Black characters and the celebration of show business family are powerful enough to trump any tendency towards stereotyping which, in this case, can be forgiven as an accident of history. I will add that I am not indifferent to these issues, and, indeed, was willing to take a strong stand last year in the case of “The Scottsboro Boys” at A.C.T. Such concerns need not stand in the way of enjoying this production of “Show Boat”. “ShowBoat”, music by Jerome Kern, book and lyrics by Oscar Hammerstein II, based on the novel by Edna Ferber, co-produced by the San Francisco Opera with Lyric Opera of Chicago, Washington National Opera and Houston Grand Opera. Director: Francesa Zambello. Set: Peter J. Davison. Costumes: Paul Tazewell. Lighting: Mark McCullough. Fight Director: David Maier. Choreographer: Michele Lynch. Conductor: John DeMain. Chorus Director: Ian Robertson. Sound Designer: Tod Nixon. Pete: James Ahser. Foreman: Joe Giammarco. Queenie: Angela Renee Simpson. Steve Baker: Patrick Cummings. Cap’n Andy Hawks: Bill Irwin. Parthy Ann Hawks: Harriet Harris. Joe: Morris Robinson. Ellie Mae Chipley: Kirsten Wyatt. Frank Schultz: John Bolton. Julie La Verne: Patricia Racette. Natchez Girl: Carmen Steele. Magnolia Hawks: Heidi Stober. Gyalor Ravenal: Michael Todd Simpson. Sherrif Vallon: Kevin Blackton. Dealer: Phillip Pickens. Queenie’s Friends: Simone Paulwell, Tracy Camp, Samantha McElhaney, Rachelle Perry. Girls: Kathleen Bayler, Sally Mouzon. Backwoodsman: Christopher Jackson. Manager: James Asher. Young Kim: Carmen Steele. Mrs. O’Brien: Sharon McNight. Mother Superior: Mary Finch. Max Greene: Patrick Cummings. Jake: Matthew Piatt. Maitre d’: Kevin Blackton. Lottie: Erin Neff. Dolly: Janet Campbell. Drunks: Phillip Pickens, William O’Neill. Emcee: James Asher. Teenage Kim: Melissa Heinrich. Woman: Simone Paulwell. Young Man: Anthony McGlaun. Lady on the Levee: Tracy Camp. 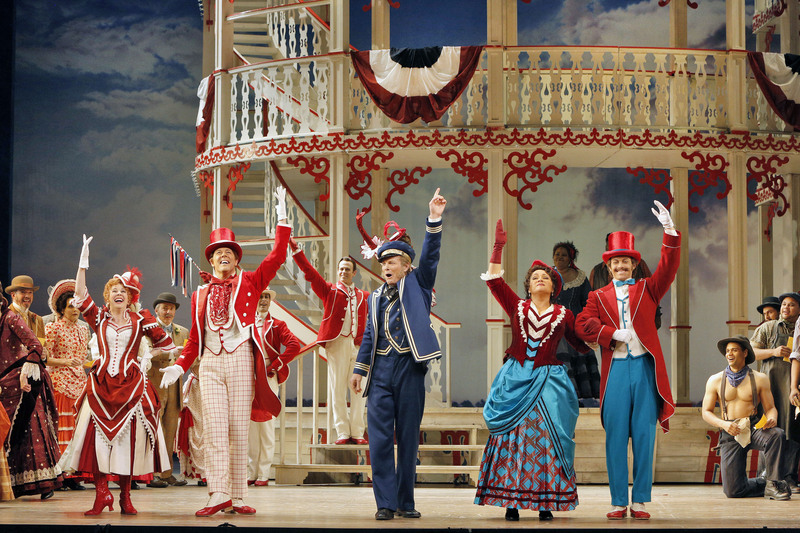 Posted in Reviews.Tagged Angela Renee Simpson, Bill Irwin, Charles Kruger, Heidi Stober, Michael Todd Simpson, Morris Robinson, Patricia Racette, San Francisco Opera, San Francisco Theatre Reviews, Show Boat, theatrestorm.